I’ve been thinking about this for a few days. I’m doing fresh installs of win7pro-sp1 on three machines and have been wondering if I should bother with any updates. To begin with, I don’t use other MS products like Office, Defender, and Security Essentials, etc. Nor do I plan to upgrade to a newer OS. I also don't use Internet explorer. The lack of user-control and transparency with the MS update process really annoys me. From reading at the RyanVM & MDL sites, it seems that, in order to gain control over the update process, one must waste a good amount of valuable time identifying good and bad updates, and downloading 3rd party tools. So far I’ve been lucky with the many XPpro-sp3 setups (without further updates) that I’ve done for friends & family. In 12 years I’ve only had to reinstall OS on one machine. And that’s because the user was baited and clicked on some bad stuff. Looking at the wider picture I think what worries me more than hackers is MS. They’re the menace. They’re the ones who are actively taking away user control, actively trying to change BIOS to not accept legacy products, actively outdating existing hardware via updates, actively trying to upgrade OS to an unwanted product. You may download and install Simplix UpdatePack7R2 v17.12.15(x86/x64) from Dec/15th/2017. This pack do not contain telemetry updates and this Dec. update do not contain any updates related to Meltdown and Spectre yet (they started on Jan. 2018) , so no performance impact. Previous links may require register on that forum, for your convenience I copied here for you the download link. I only install updates as need be. On my newest build, it has just the service pack for Windows 7 in it, and any updates that were "required" when installing specific programs, or any that were redists that were installed by programs. Thank you for the simplix link alacran. I gave the simplix updater a test run on a spare disk. After I installed the OS, I went to installed updates, and there were only two listed. I then ran the simplix updater (17.12.15), which added 178 updates (it also removed one of my existing updates). The update process lasted almost two hours. It restarted itself 3 times, as it only seems to process 80 updates max per session. Certainly install media may have some in there. I do not remember exactly, but it is likely the image I used had some updates in it already, more than stock DVD would. You may integrate the Update Pack to your selected install image index or all if you want (it takes long time for all indexes) on your ISO in a single run, see: http://forum.oszone.net/post-2609527-2478.html (Use Google translate to read it in your own language). Continuing with my test setup…. From the simplix blog site, I downloaded patch 18.6.15, ran it, and then ran the new 18.6.15 updater it created. I began with 178 updates (from simplix 17.12.15). The 18.6.15 updater scanned the system and determined I needed 7 new updates. After the install and restarts the new total was 170 updates. 3 of the 7 new updates didn't show up in the list. And 12 previous updates are now missing from the list. Is that normal behavior of simplix update process ? Also downloaded InSpectre, release #8. Do I now look for Intel download for Ivy Bridge processor ? I'm mildly chuckling (in a good way) at what you are letting yourself be dragged into as this thread progresses. You start off just wondering if installing Win7 SP1 is okay. Then you fire yourself into a process of trying different options to see if you can update the 'good' stuff and miss the bad stuff. Not the best way to go in my opinion. I have installed Win7 Pro. x64 SP1 on my computer and, after, now, several years of use, have never had a problem with it -- rock-solid stable. I have Win Updates blocked at a couple of points on the system, so this is never going to update, ever. Of course your system will be different from mine so that might not work for you. But if it was me I'd just try try the bare install of Win7 with SP1, see if it is okay, and don't tie myself in knots trying to work around a problem that doesn't exist for my machine. Yup, this is what I avoid! Looking at the wider picture I think what worries me more than hackers is MS. They’re the menace. They’re the ones who are actively taking away user control . . .
Yup, too! Don't dance with the Devil unless you are utterly, utterly pressed into it. All the above said, having read this thread I do like the advice you are getting from others about how to update 'safely'. I've bookmarked this thread for my own use in case I ever need it in the future. But I'd never do it unless completely pressed to it. Don't dance with the Devil unless you are utterly, utterly pressed into it. Yes, the advice has been good here. It took almost 3 hours to install the 2 update packages onto my test setup. Blind trust was necessary. All I see is the update label (security, hotfix, etc). I'm not given any meaningful information about them. Starting in, I guess it was spring 2016 I got serious about making a win-7 install image using RT7. My focus was 32-bit win-7 ultimate. I started with win-7 SP1 installation disk and acquired a ton of individual KB's, and separated out the "bad" kb's (win-10 nags, telemetry, etc). By mid to late August 2016 I had my "final" version, which was SP1 + 281 KB's rolled in. The last kb (numerically speaking) was 3179573. The last kb I was keeping track of (but not installed) was 3173040. So at that point it would have been early September 2016, and that's when (I think) MS changed to a monthly cumulative rollup - a single update that contains god knows what. At the time I was asking if anyone was taking those things apart to get at (and maybe evaluate) the individual kb's but my impression was (and continues to be) - no - nobody is doing that. So that's when I stopped caring (because with MS there is no trust) so on the handful of win-7 systems I either use or manage, I've not done any updating on them AT ALL since August 2016. In december 2017 i installed Updatepack and my list was 190 updates, now in july 2018 178. There are several superseded i guess. ...I've not done any updating AT ALL since August 2016. ...my list was 190 updates, now (in july 2018) 178.... superseded i guess. 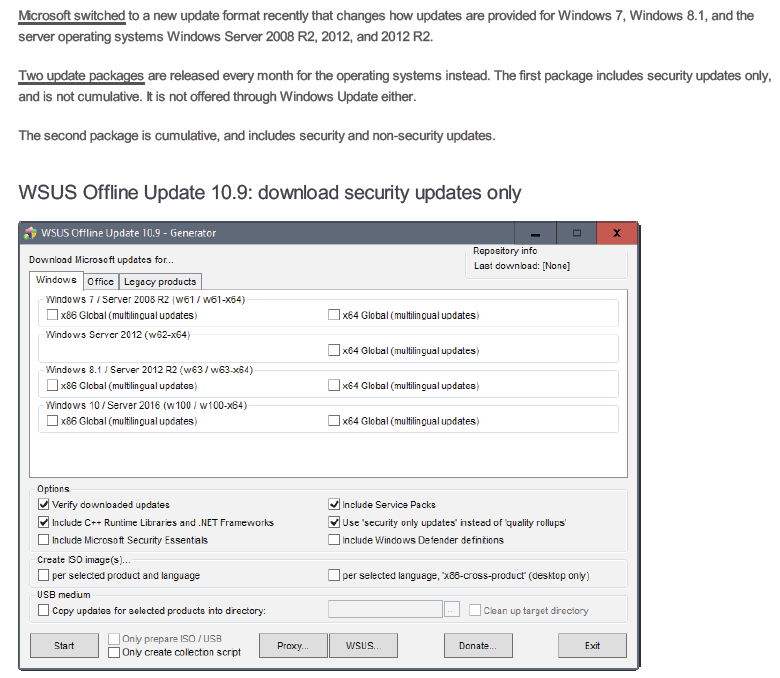 I've come across another freeware updater called WSUS Offline Update. But... a couple of people on their forum have said that MS has introduced unwanted updates by masquerading them as security updates. +1 for 'don't bother'. I also only install any KB's as and when absolutely necessary. The thing I found most irritating about Win7 was not only having to shut off Services that were not required but also having to spend an inordinate amount of time turning off items in the Task Scheduler and Start Scheduler which report back to MS on a regular basis unless disabled. However, having done all that as well as installing the Ram patch (have win7 x86) which can now detect and use 8GB of ram, I find the system is running nicely. I dual boot with XP SP3 and also did not bother with any updates on that o/s either.